Between Cardi B’s Birth of Venus-esque gown at the 2019 Grammys, Kim Kardashian-West’s artfully curated IG feed, and the archive looks worn by Solange as part of her When I Get Home visual album, escaping talk of Thierry Mugler is close to impossible at the moment. Since he first burst onto the scene in the mid-70s, dressing the likes of David Bowie, Grace Jones, and basically every supermodel you can think of, the French Couturier proved himself a force of nature, whose influence still rumbles throughout fashion. And now, thanks to Cardi et al, his otherworldly, future-facing creations are being brought to the attention of an entirely new generation. Also keen to celebrate Mugler’s wildly fabulous legacy and explore his impact on the vast frontier of popular culture is curator Thierry-Maxime Loriot, the man behind new retrospective Thierry Mugler: Couturissime. Opening at the Montréal Museum of Fine Arts last weekend, the exhibition takes an in-depth look at the visionary’s 40 year reign at his eponymous label, prior to his departure in 2001. Having previously worked on London exhibition Jean Paul Gaultier: From the Sidewalk to the Catwalk, Loriot joined forces with Mugler to present a show featuring over 140 archival prêt-à-porter and Haute Couture designs, as produced by the designer himself. Alongside the garments are a selection of documents and sketches that disclose the creative processes undertaken by Mugler, allowing visitors a glimpse at how he brought his innovative visions to life. On the line-up are iconic looks from George Michael’s “Too Funky” video, pieces Mugler designed for the 1985 Comédie-Française production of Macbeth, and many more, as Loriot seeks to highlight the designer’s deep-rooted interest in futurism, robotechnics, and the idea of the femme fatale. Elsewhere, a series of photographs by some of fashion’s finest image-makers are displayed, with iconic shots by the likes of Helmut Newton, David LaChapelle, and Guy Bourdin among them. Showcased alongside his designs, the images convey the spectacle of Mugler’s most radical, flamboyant ideas, which sit in a territory somewhere between fashion and performance. Here, Loriot shares how the exhibition was pieced together, working with Mugler, and the designer’s incomparable influence on fashion. 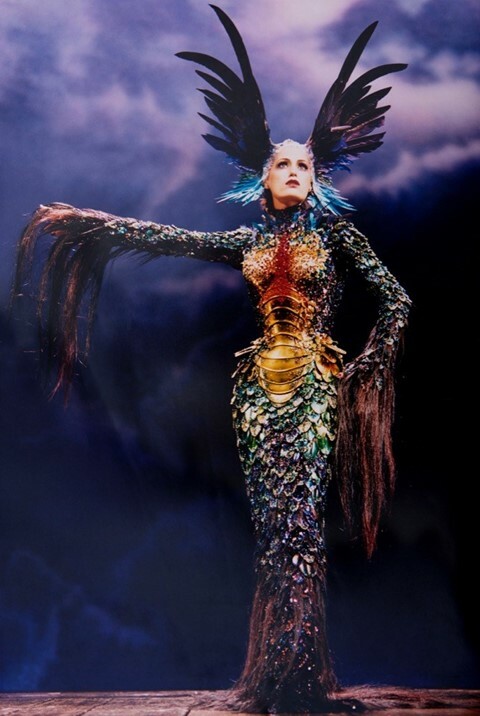 How did the exhibition come about and why did you want to spotlight Thierry Mugler? Thierry-Maxime Loriot: One of the first exhibitions I ever produced was Jean Paul Gaultier’s From the Sidewalk to the Catwalk, also at the MMFA, and I’ve always loved working with visionaries. Fashion today is less about the garments themselves and more about the styling, but I’ve always been impressed by people who create alternate universes through storytelling – something I’ve always admired Mugler for. The Gaultier exhibition was a huge success, so when I got the call asking if I wanted to make an exhibition about Mugler’s work, I was super happy. I knew that museums had previously approached him but there has never been a major Mugler retrospective, so it really was a big deal for me. The installation is really about his obsessions. How many garments are exhibited? Thierry-Maxime Loriot: Around 150. These are taken from both Mugler’s prêt-à-porter and Haute Couture archives: the label has essentially kept almost everything, so, as you can imagine, there’s a lot to choose from! There's also 100 or so pictures from different photographers featured alongside sketches, as well as a series of accessories that have never been seen in a museum before. Why do you think Mugler had such a massive impact on fashion? Thierry-Maxime Loriot: When Mugler started doing Haute Couture in 1992, he was extremely innovative: spectators considered his work as art. He was progressive in transporting Couture into something modern and contemporary, he brought something new whilst still working with tradition. He used a lot of specialist materials like metal and rubber – something which made his craftsmanship so unique to historic Parisian Couture. The insects, animals, the robots: no other designer ever attempted to create something like that. They were scared to! Mugler was among very few who could produce something of that level – he had so much authority in the Couture world. From when he started designing ready-to-wear in the 70s, to his later designs in 2001, he occupied a big space in fashion. He wasn’t following trends, he was creating from his own imagination. Similarly to Rei Kawakubo at Comme, it was about designing his fantasy world and offering new perspectives. What was it like working with Mugler himself on the project? Thierry-Maxime Loriot: As a curator it was essential that I brought my own interpretation of his work to the table, whilst still encapsulating Mugler’s universe. We went through what he liked, disliked, and what he thought was most important to showcase. He was very open to suggestions and didn’t dwell on nostalgia. He looks to the future, looking at different ways to modify the past. Tell us about the pieces in the exhibition, which are your favourites? Thierry-Maxime Loriot: I would have to say the robot suit from the AW95 collection, it is the most extreme piece of Haute Couture that has ever been made. He spent more than six months creating it with specialists. I really think it’s what the future of Couture will look like, it's surprising and in terms of craftsmanship, it really pushes boundaries. It demonstrates Mugler’s interests in transhumanism, in modifying the body and creating new silhouettes. All the robot suits embody the savoir faire of the Mugler atelier. The Chimera gown worn by Adriana Sklenarikova is also a really amazing piece that not many people have witnessed in real life. That’s what is beautiful about the exhibition, people have never had access to Haute Couture like this. Thierry-Maxime Loriot: That you can be different and you don't have to follow trends. You can be criticised and judged but you should know art is a place where freedom and expression should dominate. I think the new generation of designers and artists live in the fast lane of social media where everything culminates with the number of likes you have. It's easier for people to try and fit in but I want to show that you can be different and be successful, that you can leave an imprint on history like Mugler – you just have to dare to be different. Do you think we'll ever see another Mugler in fashion? Or do you think the industry has changed too drastically? Thierry-Maxime Loriot: There are a lot of great designers at present but the whole system has changed. With fast fashion evergrowing you have these big corporate groups that control the industry. It’s a difficult time for young designers to become successful, it’s essential for them to have a great support system. It's the same with fashion exhibitions, people don't go to the movies anymore because they have Netflix. They don't go to bars and clubs because you can meet people on apps. You have to be innovative to attract people to your work. How do you feel about the likes of Cardi B and Solange bringing Mugler to a new generation? Thierry-Maxime Loriot: Lady Gaga did the same when she wore Mugler in the “Telephone” video in 2012. Beyoncé did it in 2009, as did David Bowie, Diana Ross, and George Michael – they all wore Mugler. What’s great is that his designs are transgenerational. It’s great that Cardi B is bringing his work to a younger generation: after all, his fashion is timeless. When you visit the exhibition it's impossible to see it with a systematic approach, it’s impossible to say “this is very 70s”. Mugler’s work transcends all of that. It’s futuristic, but it's also rooted in now.